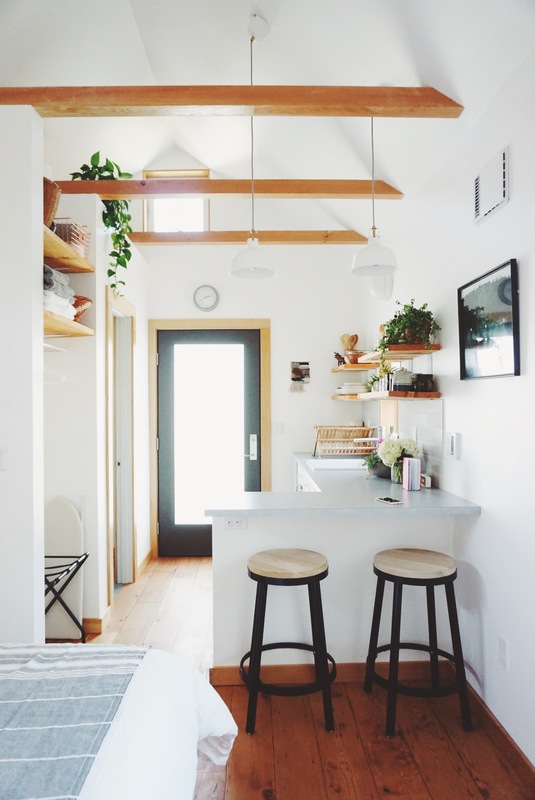 When I got the email inquiring about consulting on the interiors and decorating of a Portland Tiny House, I was thrilled. These are some of the jobs I love the best. 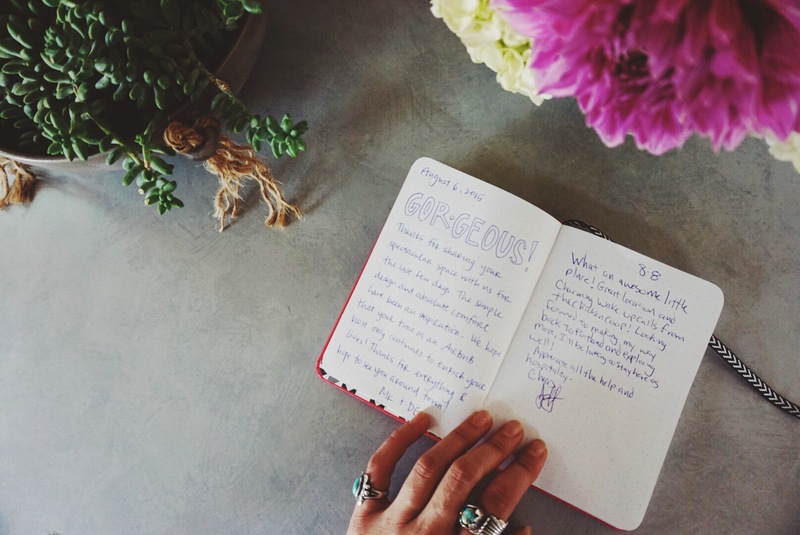 Collaborating with people to make their spaces more magical feeling, more intentional, useful, and beautiful. Genevieve was a wonderful client, and had an incredible Pinterest board of items I already loved, so the vision from the beginning was clear. I stopped by to take some photographs after the space had been up and running for about a month. It was so great to see my ideas implemented and working smoothly. When we first began the project, which was a garage her and her husband were converting to turn into an Airbnb, it was a bare space. They originally were going to go with a faux wood flooring, but I convinced them to use a real wood. I am so glad they did! The wood offers such a warm and cozy feel to the place. 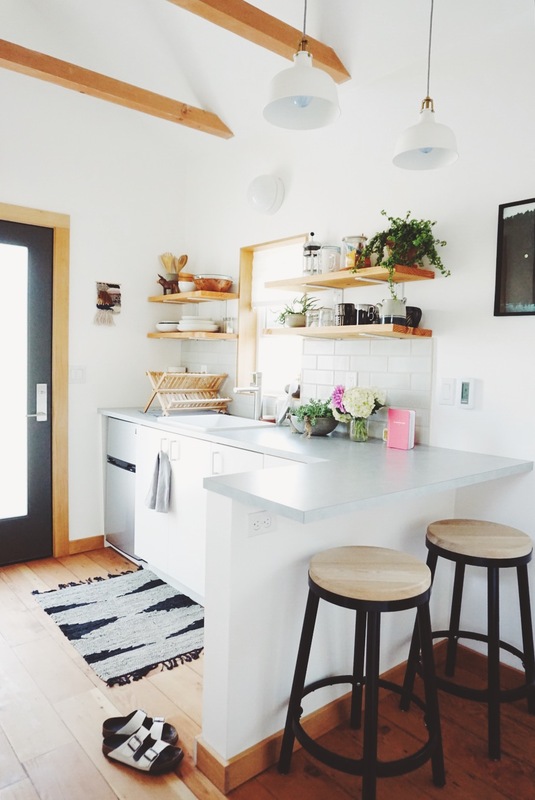 I love the light in the kitchen, pops of color and contrasting paint make a modern statement while being cozy. We used a lot of white and natural materials to decorate the space. 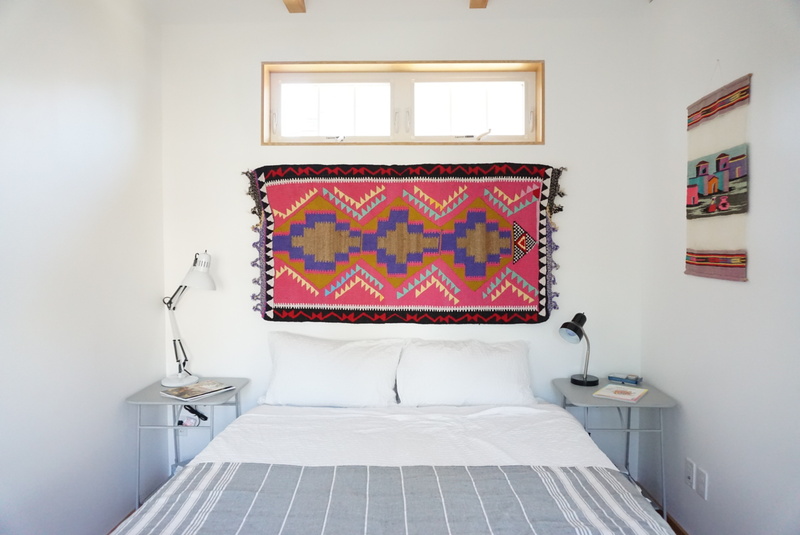 A beautiful and special rug from Kaya Kilims was used as a headboard. I love repurposing rugs in this way. They aren’t only for the floor! Imagine the possibilities! Other textiles came from collecting at vintage shops. I like matching tables but mis-matched lamps. I always love having my own bedside lamp and table. From a Feng Shui perspective, it creates balance. The end tables are from Urban Outfitters. On our install day, I walked into their house, and Genevieve had laid a beautiful spread of snacks out for us to share. Her daughter was around being so sweet and curious throughout the process too. 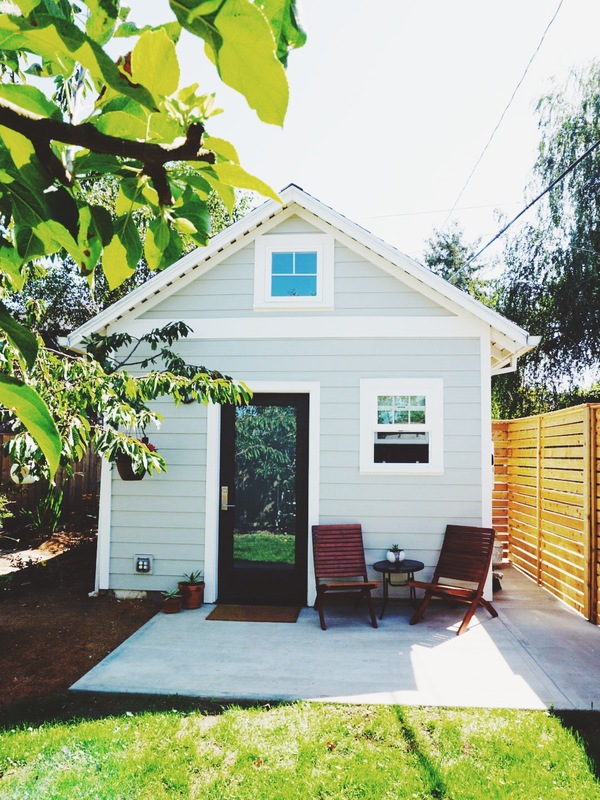 You can tell a lot of love will go into the Portland Tiny House for years to come. 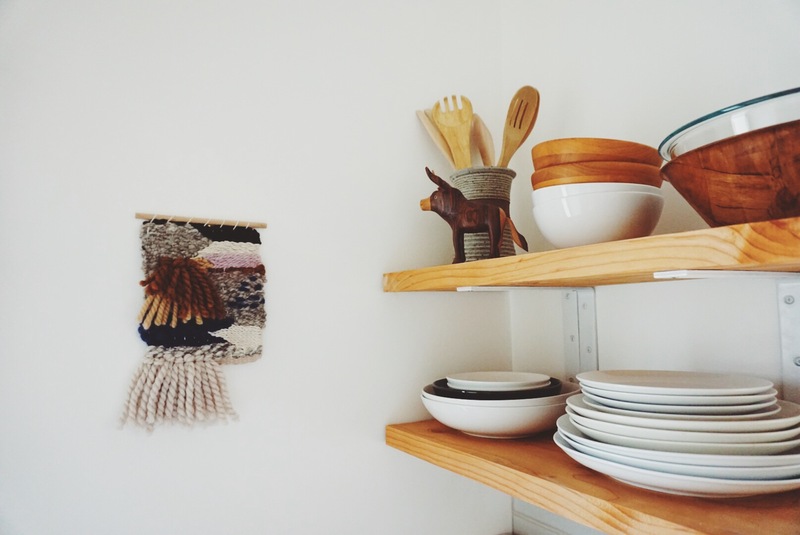 The owners own little weaving hung on the kitchen wall. One of my macrame pieces hanging in the bathroom. 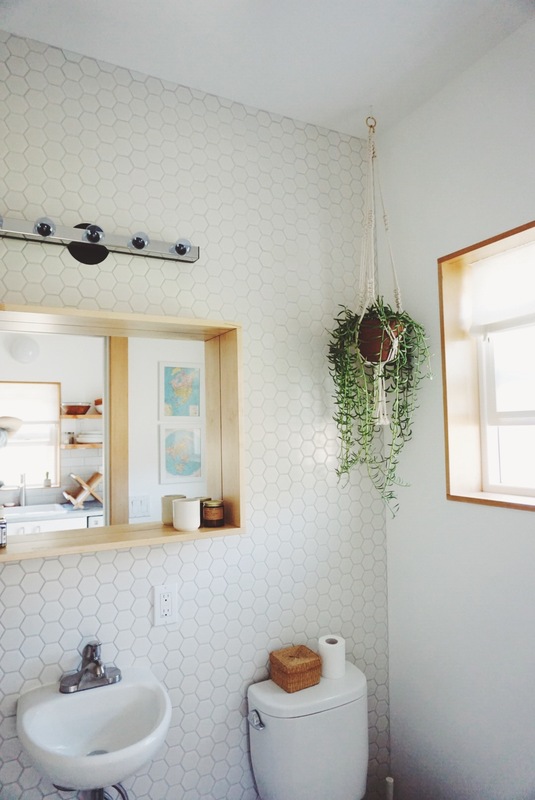 I love the hex tile and Ikea mirror. Kitchen cabinets are from Ikea. Thank you to Genevieve and the Portland Tiny House! I loved this project and hope to work with more amazing people like this. I can honestly say this is the most beautiful tiny house I have ever seen!!! Love every single detail. 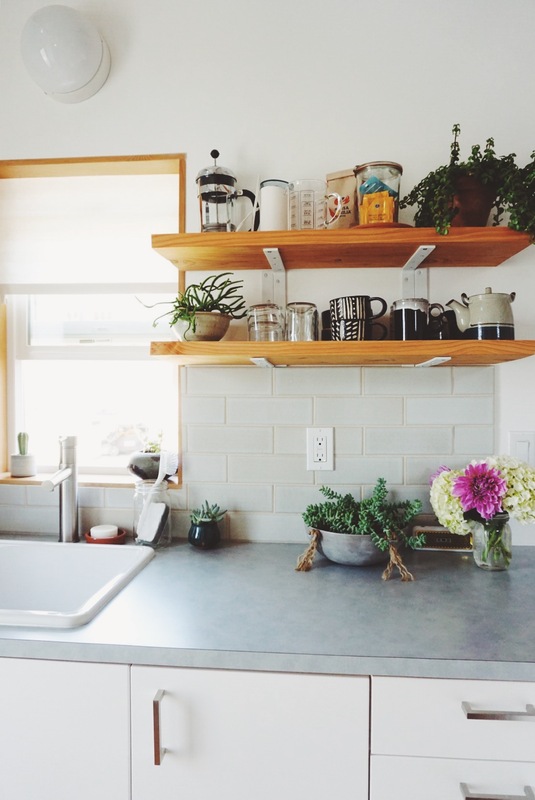 I was wondering if you could tell me what material the benchtops are? Love the idea of using kilim carpets…..there is also kilim embroidery…..it looks like knitting ….looking forward for your ideas . I do makrame with was threads for jewelry…. 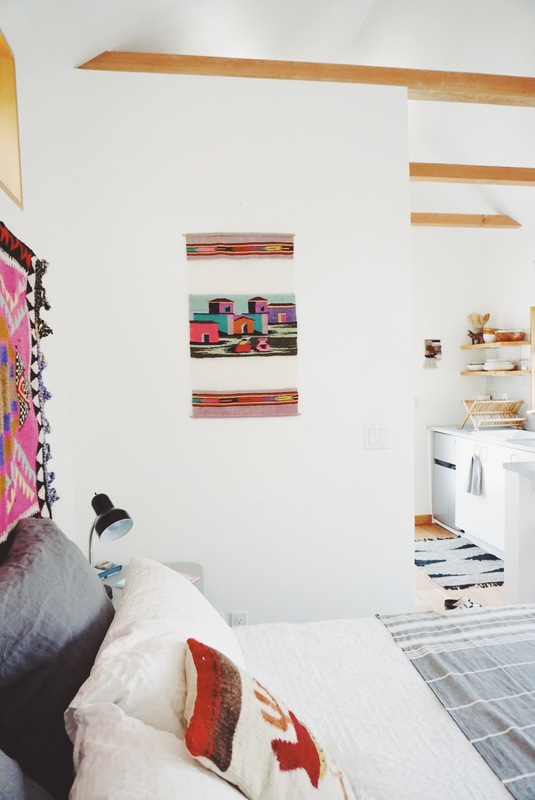 I love that kitchen rug! Where is it from? Thanks!